I'm happy to welcome you to our latest addition to easy-strawberry-recipe.com...The Strawberry Bookstore! At the Bookstore browsing for your favorite book or cookbook has never been easier. Pull up a chair and "wander" our book-filled "shelves" for the easiest shopping experience. In keeping with our website's conviction to deliver easy solutions to your cooking (and other) needs, we welcome you to browse for that special cookbook or gift idea. Enjoy browsing the Strawberry Bookstore for your favorite cookbooks! This Strawberry Bookstore page is in association with Amazon.com. I receive a commission (with no added cost to you) if you purchase books, CDs or videos after you link to Amazon.com through this bookstore page. Proceeds go to supporting easy-strawberry-recipes.com on the Web. Please keep us in mind whenever you're looking for a book, or other gift item.....whatever the occasion! Here are some titles that I personally recommend for your own use or gift giving needs! Fresh strawberries are one of the great culinary joys of summer. Here are 40 great strawberry recipes from master chefs--dishes that will let you enjoy the flavour of these beautiful and plentiful berries any time of the day. Indulge yourself at breakfast with Strawberry Pecan Muffins, enjoy tasty entrées such as Poached Salmon with Strawberry Leek Sauce, or savour delicious desserts like Wild Strawberry Pie. Photographed on location at more than 25 fine restaurants and inns, these innovative dishes look as good as they taste -- and anyone can make them! Every one has been tested and adapted for home use. Have a taste of what’s cooking in Strawberry Shortcake’s kitchen! 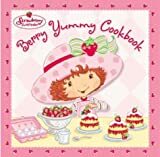 With lists of common cooking terms, rules for kitchen safety, helpful tips from Strawberry herself, and chapters for breakfast, lunch, and dinner, dessert, and snack recipes, this book has all of Strawberry’s favorite recipes and is perfect for young chefs. Strawberries are not usually considered to be a very versatile cooking ingredient. Yet, in this book, Helen Siegel confounds expectations with such recipes as spinach, citrus and strawberry salad, and savoury salsa with red peppers, red onions, cucumbers, chiles and strawberries. One of the easiest and most delicious ways to consume the recommended 5 to 10 servings a day of fruits and vegetables is to drink them. Packed with nutrients and low in calories, smoothies are a fast, easy and great tasting way to achieve good health. The Smoothies Bible is the most comprehensive source of information to explore and detail the health benefits of these easy-to-make drinks.